We got a shipment of nani IRO fabrics last week. It created quite a flurry! About half the shipment was gone within 48 hours of arriving. Wow. I’m placing another order this weekend and I’ll try to get even more this time. As soon as I saw how quickly the fabric was going, I knew I had to think quickly to figure out a few projects for myself. I decided to try a Tova from the grey dot flannel and also a skirt from this navy painted canvas. 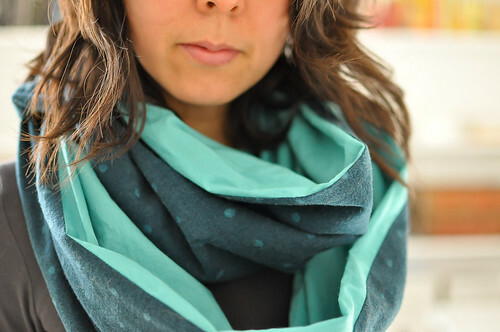 I thought it would be fun to do a quick scarf from one of teal dot flannel and one of the solid voiles as the backing. 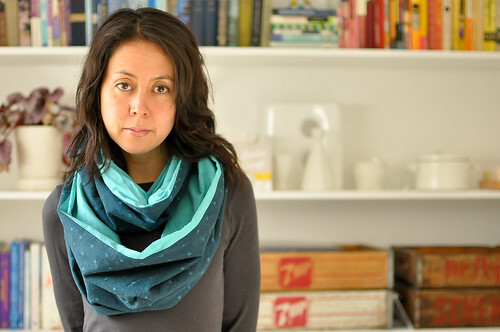 Something with instant gratification and super cozy too! I used the Anna Maria Horner Figure 8 Scarf tutorial. I used just a metre each of the flannel and voile. Anna Maria Horner’s pattern calls for an 18 x 79″ strip of fabric for each side, so I just cut two strips out of my metre and pieced them together to make the full length. The scarf came together in less than an hour and I totally love it! I made one change to the pattern by shortening it by about 6 inches. I wanted the scarf to wrap closer to my neck. If you’re making the scarf, you might want to test out the length before sewing the loop together to adjust it to your preference. Best part is, I’m wearing my nani IRO right away. Love this! I got one of the kits for Christmas and sewed it up right away, but its way to big for my tiny frame. So I’m definitely going to have to take it apart and adjust it! But love your two-toned teal version! 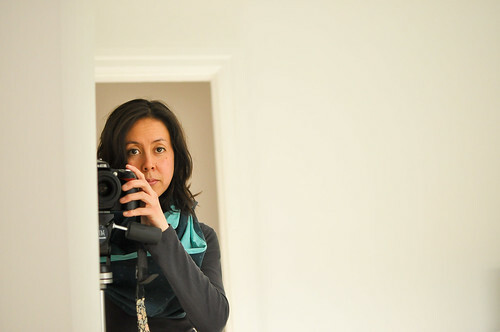 Love your version of the Figure 8 scarf Karyn! I came across the tutorial a few days ago, and was planning to use a solid soft ‘skin’ fabric and a print cotton for mine, but even if I make it using those, I will have to come over the shop to get a hold of some of that gorgeous fabric you used when you get some more… they are just lovely!